I am about 70% of my way through my Goodreads Reading Challenge and, being human, I feel myself flagging a little when it comes to reading at the moment, so whilst I am currently reading Lowland by Jhumpa Lahiri, I have also taken much needed time out to do some more adult colouring. These past few weeks have carried more stress than usual as I have been worried about Tinky and have been a little run down myself. However, as worn out as I have felt, I have enjoyed unwinding and getting creative with my tools of choice (gel pens and felt tip) , I even managed to practice some shading with my less than adequate coloured pencils after watching techniques on YouTube, which I had no idea about. 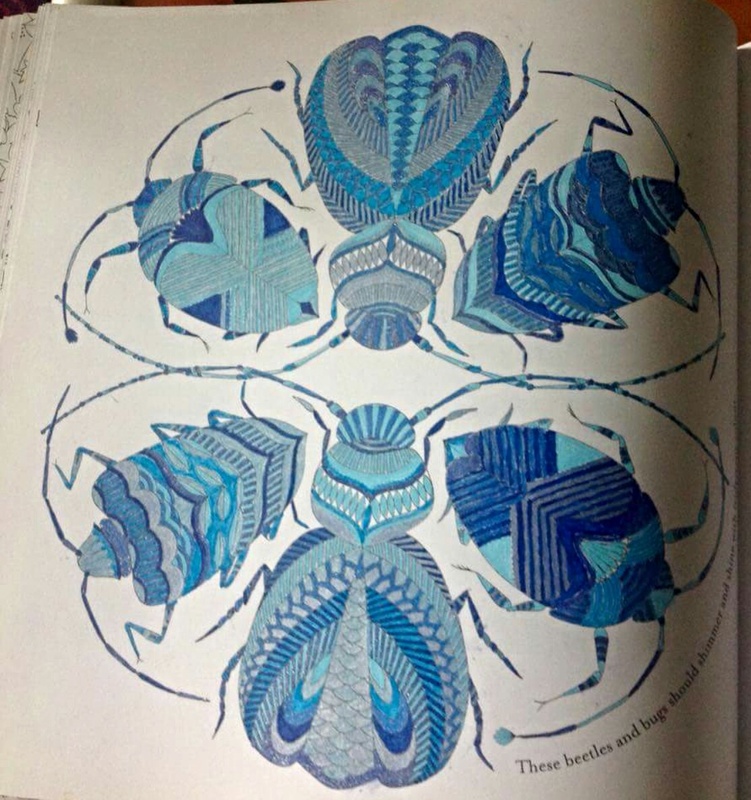 My blue bugs was the first picture I decided to use one colour and found I had seven shades of blue to work with. I was very pleased with this one, if a little sick of blue after I had finished. 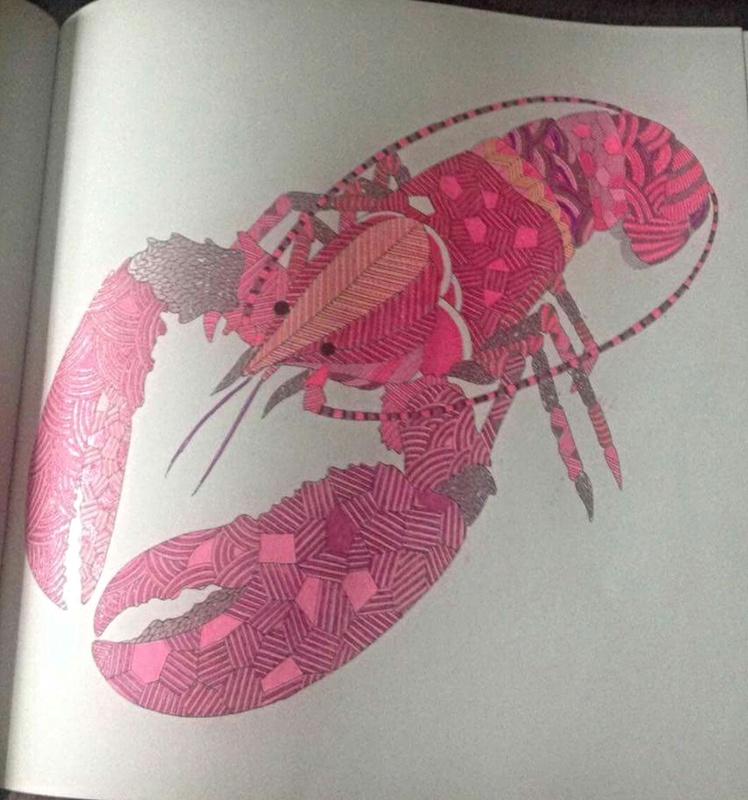 My lobster demanded a bit more intricacy and I had an opportunity to plunder the pinks in my gel pen collection. I enjoyed colouring this one and was surprised it didn’t take me as long as I thought it would. 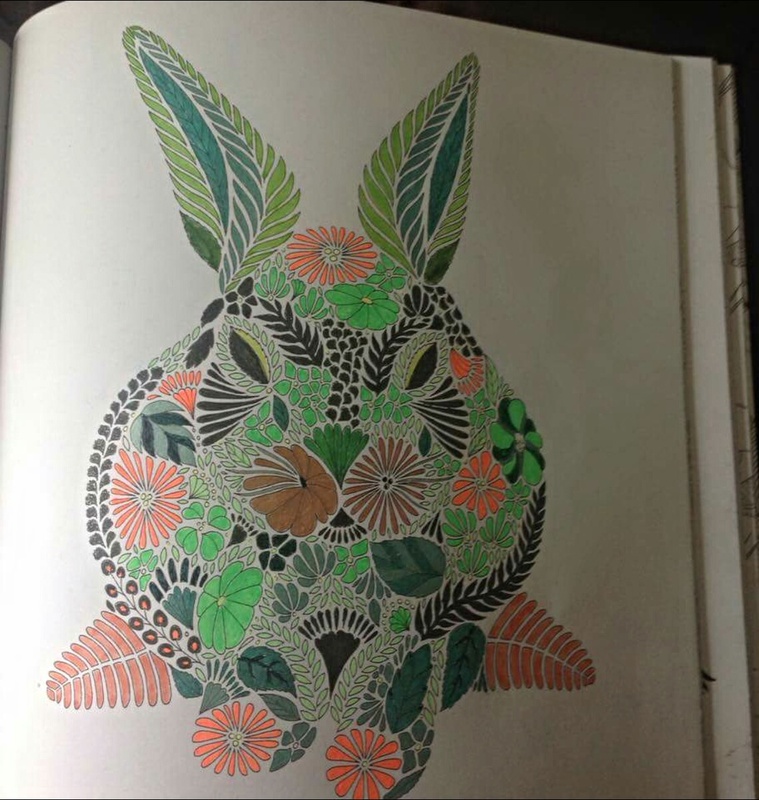 I started colouring this rabbit with the intention of utilizing the neon colours in my collection but then half way through I wished I’d coloured this in black, however ultimately I decided to finish this with the premise of you are what you eat, hence carrots and lettuce. 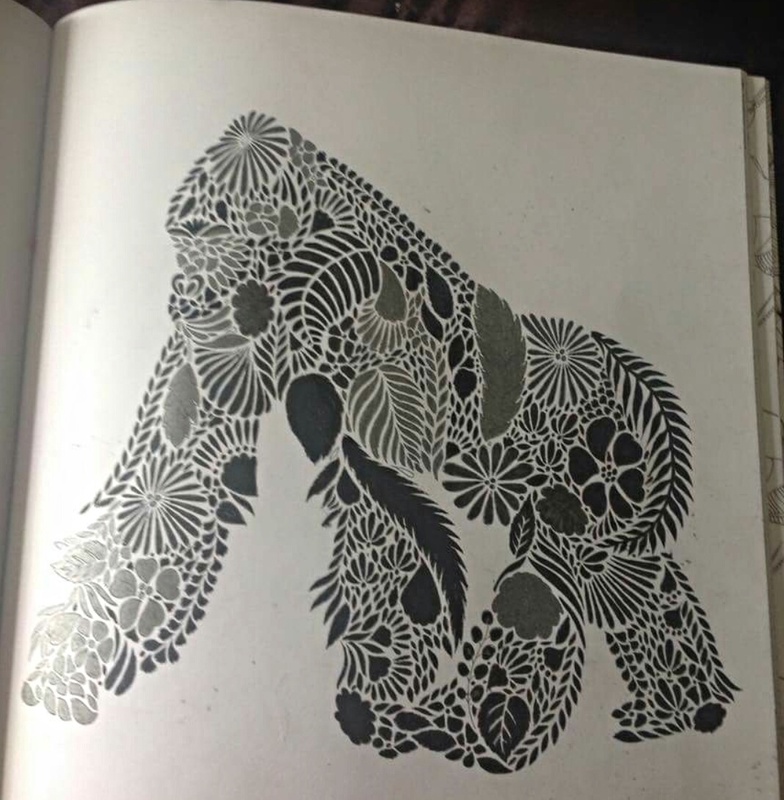 My gorilla was the next picture I tackled and indulged my vision of another monochrome picture but in black. Again I used gel pens, making full use of glitter and metallic shades of black. One of my favourite pictures so far. My most recently completed picture was this one where I tried to use flamboyant colours and used my new Faber Castell pens as well as my gel pens. I think this one is my best one to date and was very satisfying to complete. It was nice to have a centre spread I could colour without the awkwardness at the spine of the book. I have completed 2/3 of Animal Kingdom by Millie Marotta, over 3 months and have purchased a Colour Yourself Calm book, which contains mandalas to complete but as a mindfulness exercise, I haven’t started this book yet as I want to finish colouring the majority of the pictures in Animal Kingdom before I start another book. This will be a challenge of posture and focus. I also have Animorphia, which is a more intricate colouring book but also a find the object game. Both new books are very different from Animal Kingdom and from each other. I look forward to tackling them soon. I had my own rough period in April and May. The challenge is a great thing, but I’m behind too. Remember reading is something we do because we love it. The challenge is only peripheral. Don’t let it be something to cause stress. I love the pictures. So true, Steph. The mind needs a break sometimes, despite my virtual presence here. I have real life stresses and I am wondering if my taste in thrillers causes more stress? It maybe time to immerse myself in a gentler genre? Maybe just a break for a while. Then I feel guilty, but there’s no point wearing myself out, I suppose. I start getting irritated over typos etc., where I would be a little more tolerant, although my current book Lowland by Jhumpa Lahiri is hitting all the right notes with me. Can I just say… Wow … about the artwork, You have quite a talent. If you’re looking for something calming and not in the thriller’s genre Go Set A Watchman might fill the bill, it’s relatively short and could probably be done in a day or two, and will probably set your mind to relaxing enough to sleep sitting up. My favorites for relaxing and just letting my mind go are Karen by Marie Killillea and I Heard the Owl Call My Name by Margaret Craven. Both are based on true life stories (Karen was written by the mother of the main character) and are low angst. I have also recently discovered Kumihimo, Japanese braiding. It’s wonderful for just letting the mind go. You can keep your hands busy without a lot of mental presence and is a lot less expensive than other arts and crafts. A bag of craft yarn (looks like embroidery floss in the package but isn’t. I think there’s about 40 skeins to a package), a couple packages of bobbins and a Kumihimo disk cost me less than $40. Enjoy your relaxation! It’s the time of year for it :). Thanks for the book recommendations, I will definitely check them out and Kumihimo sounds fascinating, I love working with textiles so am heading over to YouTube to investigate. Lol, quite welcome :). It’s not as versatile as knitting and crocheting but is a lot more portable and will probably fit in your purse if it’s not a mini or micro, lol. I’ll try to remember to post some pictures later, once the sun is up, of my first couple of efforts. Thank you too, I don’t think anyone has ever said I have a talent for anything, so I’m kinda shocked and realise I need to learn to accept a compliment. Lol, I know that feeling of not knowing how to accept a compliment since I have the same problem. Your comment brings me back to a couple of your previous posts. I HATE looking for praise but I find myself seeking it sometimes because we all need it, at least sometimes, in order to feel some sort of self worth. Anonymous good deeds are great but sometimes you (generic you) just need that recognition that you are worthy of sharing the same air as everyone else. I saw a post earlier this week, can’t remember where, about adult colouring books. I thought it was a little wacky but thinking about it now I can remember some of my more relaxing times with the kids were sitting down with them and their colouring books and crayons and just colouring; something I haven’t done in a very long time. If I didn’t suffer from social anxiety I think coming colouring with friends would be a great pass time. Lol, that may be a way to face your fear in a more controlled setting or perhaps volunteer at the library to read to the little ones. At least our library has that programme through the winter, whether others do or not I don’t know. It’s for a set period and length of time at a set time each week so easy to plan around and I have always found it easier to be around children than adults. I think getting out into a social setting will be something I tackle soon. Book clubs are calling. sorry, that should say communal colouring. Damn you autocorrect. I’m coloring Spendid Cities right now with Prismacolor pencils. It’s exactly what I need some days. Your gel pen work is incredible. I’m afraid to try that but might need to. Definitely worth a go. Gel pens are bold and add a touch of bling. Thank you, I have seen a number of colouring book posts, so feel free to blog about your colouring. It’s very addictive as well as therapeutic. Thanks, there should be one up in the next couple of days hopefully. With my son on his summer hols from school I am not getting a minute to myself this past while !!! Oh my gosh, how beautiful your work is. So glad you decided to show us. I love the blues. I became quite excited with the mere mention of gel pens and Faber Castell. My friend and I taught our children’s class art all of last year and introduced them to zentangles/mandala. They loved it. We used black gel pens and many of them traced their hand, then added intricate designs( almost henna like) in black. It was quite lovely. I need to color myself. I loved teaching art, I’m by no means an artist but I have an eye and can teach myself things. You are 70% done with your Goodreads challenge?? I’m always behind on mine. I’m trying this year to make it. A break is often good. Sending Tinky a cuddle. It’s nice to do something creative, thank you. I’ve recently become obsessed with adult coloring myself. I’ve talked it up so much that your Appreciate Day at work the four people in my dept will be coloring while we eat and relax before our busy season kicks in. 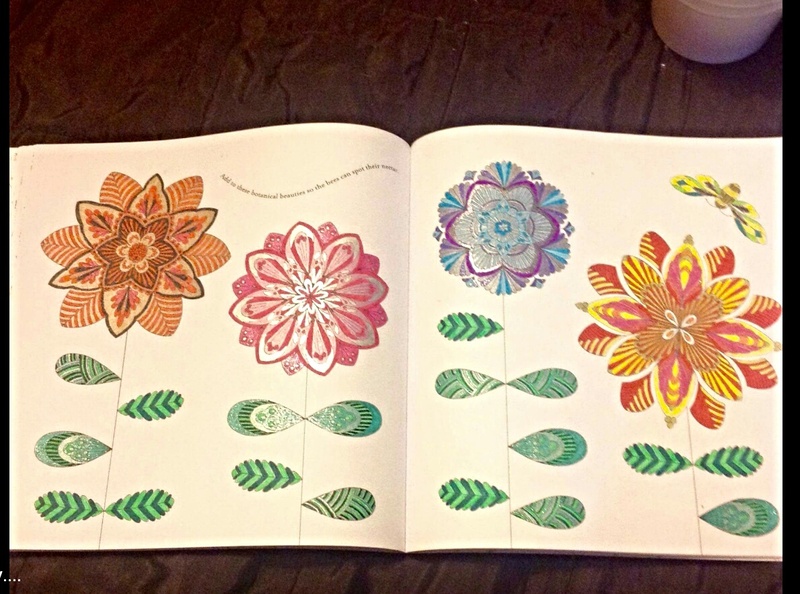 I’ve loved to color since I was a child. It’s relaxing and something challenging too as I am not naturally creative or artistic, so love that I can take joy in doing something arty. I love adult coloring books. They’re a very relaxing diversion from a hectic day. Thanks for sharing!